Thank you James for your information, I will correct the information at once. VEry nice gallery ar !!!! beautiful photos and beautiful bridge! 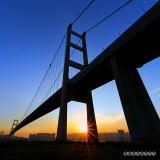 i've went to hk before and i went on the tsing ma bridge..... it was spendid! and my car broke down on it and i ended up walking the rest of the bridge cos' i left my mob at home! poor me..... but it truely is a wonderful bridge! Wonderful photos. HK people should be very proud of their bridge. Really nice pictures. Where is the Tsing Ma Bridge? Excellent work! Ireally like the 3rd photo. Where did you take this picture?